Four years prior to announcing our sunset to our colleagues in that conference room, we began mid-term financial mapping, projecting various spending scenarios. We approached our donors and our board, offering three options for defining our foundation’s trajectory: a Desirable Timeline, a Curtailed Timeline, or a Strategic Timeline. The Desirable Timeline was shorter than the planned duration of a number of our initiatives, but would allow us to spend at aggressive rates for five years. The Curtailed Timeline—a nine-year plan—was more conservative regarding assets. It would allow more time for the work, but call for some compromises about what could be accomplished in scope and scale. The Strategic Timeline scenario proposed a blend of the Desirable and Curtailed Timeline concepts, utilizing different strategies for different programmatic aspects of our work. It allowed inconsistencies to exist in our granting philosophy, prioritizing select initiatives over others. This method allowed for six additional years of funding. With donor input, the board approved the Strategic Timeline approach in 2009, and we believe it has served us well. Importantly, intensive financial planning from that moment on has proven crucial to the process. We immediately linked our deadline to our balance sheet, which prompted a new degree of accuracy and urgency regarding cash flow. We deployed new cash-based financial tools to ensure that our calculations were precise. We aimed to project and track our total resources against all known or budgeted liabilities. Initially, we recalculated our assets semi-annually, then quarterly, and now, in the home stretch, we review available assets on a monthly basis. Three and a half years ago, we revised our investment strategy to transition completely out of stocks and into more predictable and conservative fixed income bonds. About two and a half years ago, we began liquidating our real estate holdings, which enabled us to structure transfers of our properties to long-standing nonprofit partners, while also simplifying our list of assets. Managing reserves has proven equally important. While the work of our final 18 months was planned carefully, we knew to anticipate the unexpected and therefore we established a $500,000 reserve fund to cover any surprise expenses that might arise in the final months of the organization. If that money is not needed for expenses, it will be rolled into a donor-advised fund that can be used to sustain select aspects of our work. 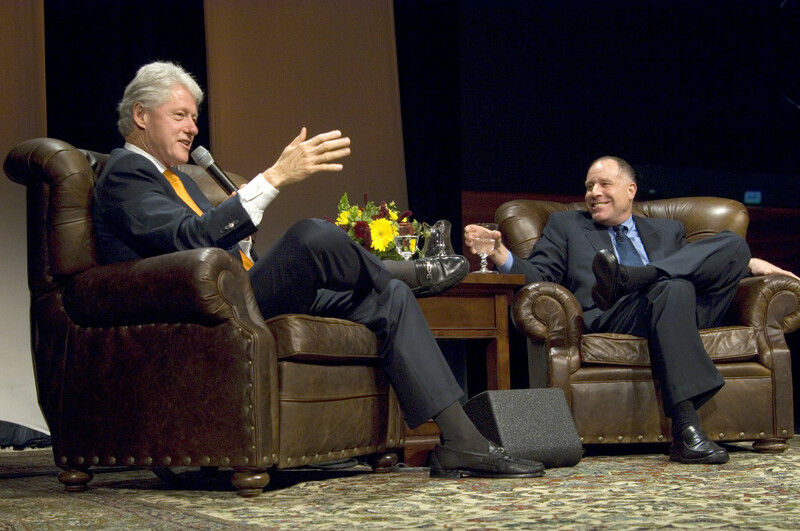 President Clinton joined Paul Orfalea at the launch of UCSB’s Master’s Degree in Global and International Studies and the Orfalea Center for Global and International Studies.